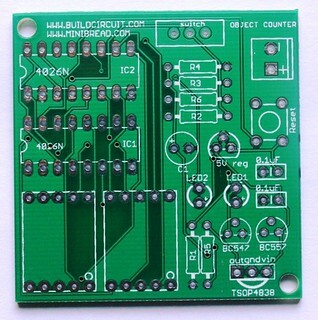 This article is about assembly of counter module used with digital object counter DIY kit. If you have come to this page directly from a search engine, please visit this page first to know about digital object counter. The suggested page gives you more details about this kit. You will eventually come back to this page, don’t worry 🙂 . 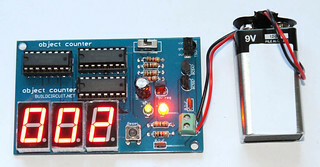 This kit includes everything you need to make a simple digital object counter. The object counter kit set includes an infrared (IR) transmitter DIY kit to make it work. The counter module and the infrared transmitter module can be kept at a distance of 1 meter with infrared LED facing towards the infrared sensor. The LED continuously transmits infrared rays to the sensor and whenever an object obstructs the rays, the ‘seven segment display’ counts from 0 to 99. Assembly of digital object counter is very straightforward and all components are through-hole. You can see the label and images printed on the circuit board and assemble the components accordingly. You can notice on the PCB that the component names have been labeled clearly. You can also check all the assembly images from flickr.com. Step 1: Fix all the resistors. Step 2: Fix 0.1uF ceramic capacitors. The code for 0.1uF capacitor is 104. You can check other capacitor codes from this site. Step 3: Fix 2 pcs of 3mm LEDs. Insert the long pin(Anode +) in the hole marked + and insert the other short pin(cathode -) in the hole marked – . Step 4: Fix BC547 NPN transistor. Step 5: Fix BC557 PNP transistor. Step 7: Fix reset switch. Reset switch resets the counter and set it to 0. Step 8: Fix 2pcs of 16-pin DIL sockets and screw terminal. Step 9: Fix SPDT switch. Step 10: Fix 2pcs of seven segment display and TSOP4838 infrared receiver. The kit uses common cathode displays. Step 11: Fix 100uF electrolytic capacitor. Step 12: Connect a 9V battery. Your counter module can be tested with a general remote control. As you press the remote control, the number on the display increases. To use the module as an object counter, you need to assemble IR transmitter module also. Please click here for assembly instructions of infrared transmitter. We have recently released a 3 digit digital object counter kit. You can buy the kit at BuildCircuit store.